If you’ve been wondering how to add a google news to my site this tutorial will show you how – it is actually a very easy process. You are going to need to add some custom HTML code to your website which you can get from Google. 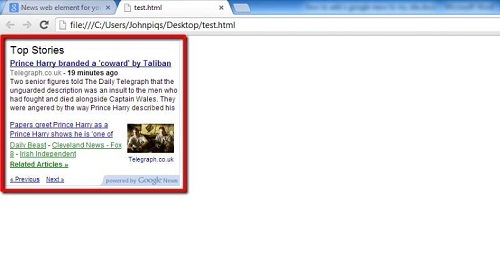 Visit “http://support.google.com/news/bin/answer.py?hl=en&answer=142899” and scroll down the page until you see the frame which contains the HTML code. Highlight everything in this box and copy it. In this example we are going to show you this code in action simply by using Notepad, you can paste the code into the relevant place on your website. Open notepad, paste the code, and save the file as a “.html” file. 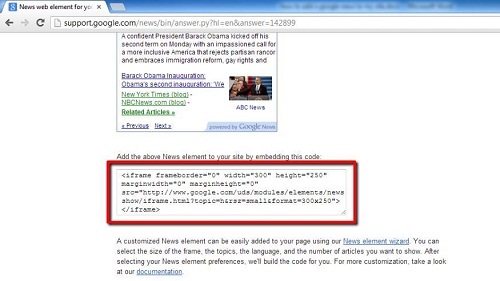 Locate the file on your computer and open it, as you can see the code works successfully – it will do the same on your site and that is how to add a google news to my site.